Sunny Smiles Dental Innovations can now offer you Fastbraces® With only our patients safety and self confidence in mind this new technology was developed to straighten teeth differently giving you the solution to the perfect straight smile. A great system with its non extraction technique, not just correcting the front teeth, but providing the most comfortable bite when both upper and lower teeth are treated together. It is the ideal treatment for adults and children especially if you child is not eligible for NHS orthodontist work. Fastbraces® allow for movement of the roots of the teeth towards their final positions from the beginning of treatment by torquing them from the very first appointment. Our patients can now get results often with less sensitivity in around a year from the starting date, and in less severe cases you can get the perfect smile in just a few months. It has been developed and tested over the past 20 years and is now become available at Sunny Smiles Dental Innovations. Fastbraces® Technology comes with a lifetime satisfaction guarantee so we can ensure you have the perfect smile for life. With the new triangular design of the braces, new techniques and a special heat-activated wire, this new technology is changing the field of orthodontics. Only one wire is used throughout the treatment unlike traditional braces where 3-4 can be used, and most cases can be treated without any extractions. Traditional braces work by moving teeth into position in two stages, and this can be quite a lengthy process usually around 2 years. In the first year, the crown of the tooth is moved into alignment. In the second year, the root is then placed into alignment. However, the brackets used with Fastbraces® work in a completely different manor altogether. The patented system uses an innovative bracket and a specially shaped wire to correct the position of the root of the tooth, from the beginning of treatment. This then allows the crown and the root to adjust into the correct alignment in almost half the time because the movement of the teeth is so gentle this is virtually pain free. 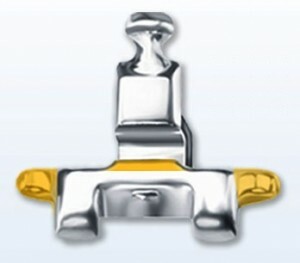 The Fastbraces Technology brackets have an elevated slot and a unique elbow design (see picture ). The shape of the bracket is so important because it literally changes the force flexibility equation. The square shape of traditional brackets defines the distance between brackets and that distance determines the flexibility of the wire. However, the triangular shape of the Fastbraces patented bracket with its elevated slot typically increases the distance between the individual brackets, which then increases the flexibility of the wire which is activated by heat in the mouth. If you have an queries in Fastbraces please do not hesitate to call any of the Sunny Smiles Team who will be happy to help you.